The 2 Up Leather Photo Album is our only ring bound album. Its simple and elegant design makes it a very practical choice. Just load your 4 x 6 photos into the page sleeves, and it’s ready to go! 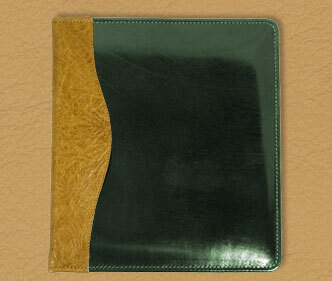 Made in the same tradition of quality as all Powell Leather products, it’s a great photo album. Personalization is available. Our albums are handcrafted from the highest quality materials available. Each leather panel is carefully selected and cut to dimension before being bound about a strengthened, moisture resistant core. Every care is taken to assure that each album will be a worthy keepsake, designed to preserve your most precious memories for generations to come. Powell only uses premium archival/museum quality page inserts composed of ultra clear low glare polypropylene film. Available in any combination of colors from our swatch. To place an order please call us !